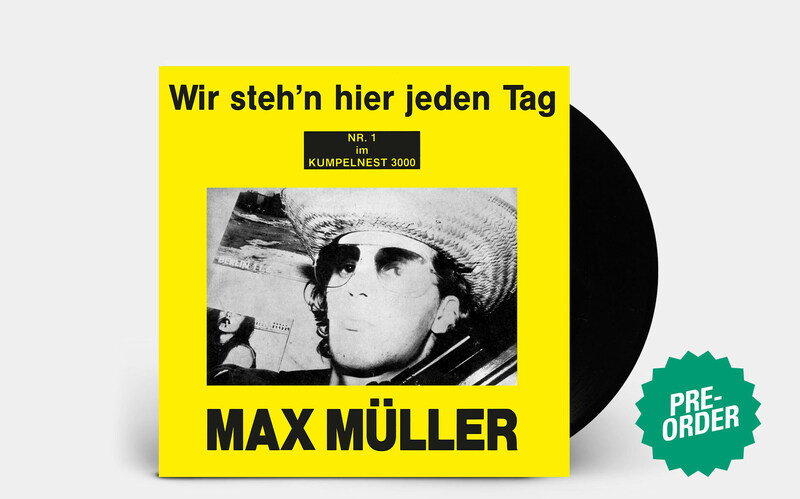 Max Müller has stood since forever for the true spirit of counterculture, for the non-appropriation of trends and movements, from his first band, the Honkas, to Campingsex and then with Mutter. Berlin-based Müller couldn’t care less about the legend status ascribed him, even if he does have hundreds of stories to tell. He has never taken part in that kind of historicisation, the development of the music always took centre stage. It is this that lead to his first solo records at the end of the 1980s. After the cassette album “Alt und Schwul” came the 1989 7” “Wir Stehen Hier Jeden Tag”: impressive juvenile punk to touch and sing along to, playing only with pure triviality. With it Müller created a memorial of banality—rough, with a DIY aesthetic—to the slightly drowsy Berlin punk scene that was to founder not long after. Müller goes one better with the B-side “Sie Ist Aus Holland”, a fresh, snotty and slightly rude introduction to a lady from the Netherlands. Those who are whiffing the potential of an “I was there” moment will be both rewarded and disappointed: the 7” will be exclusively re-issued on Slowboy in 2019 and it includes a newly recorded japanese version of ” “Sie Ist Aus Holland” – the perfect final chord for any record collection.